Motu Patlu is a popular cartoon show from the Nick channel. It's quite popular among the kids. Knowing the popularity many developers around the world has come forward to create an amazing game targetting Motu and Patlu. 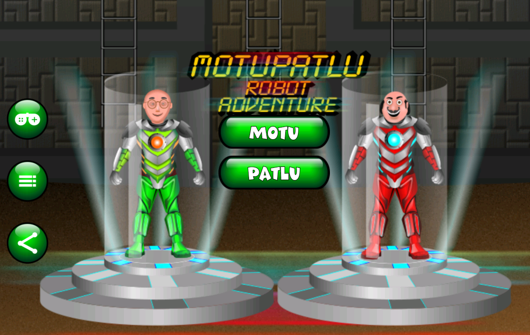 There are a number of Motu Patlu games available in play store. But one category that grabbed my interest in the Motu Patlu fighting games. It's always a fun to play fighting games. The following post will cover two major fighting games that are Soldier Commando and Motu Robot Patlu Run. This game is most suited for children. 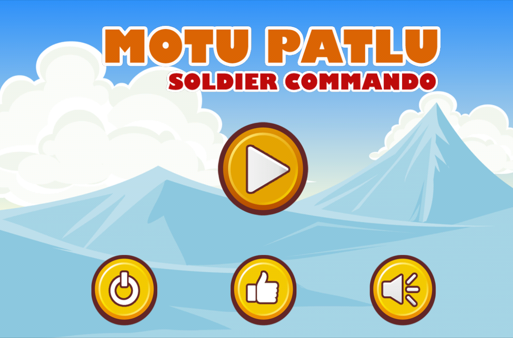 This game is like a savior game in which you have to help motu be a hero soldier who is awaited attendance by all children, you must complete a mission to save patlu held by the big bosses who are very powerful. This game resembles like a super Mario. Right from power ups and life packs to environment and background are pretty similar. And above all the music is a lot alike. Super Mario is all about saving his princess who is held in prison by evil. But here in this game motu is the soldier. And patlu is held in the possession of big boss. We have to complete the mission to save patlu from the boss. There are totally 60 levels. We can unlock a new level by completing the previous one. On 60th level probably we have to face boss to save patlu. The game is very easy and everyone can play this game. You can just tap the left and right arrow button to move in a respective direction and up arrow on the right side to shoot. And some special buttons are used for shooting. You must move the motu according to hurdles and shoot all the enemies in front of you (dragons , snails , birds, etc.) and earn points to unlock all of the levels are locked . The user interface in this game is pretty good. Everything is designed in a way for an easy understanding of children. And the game also has light colors so it can be played for a long time without any strain in eyes, especially for children. The background score is also good even though it is similar to super Mario game, It is pleasant to hear. Above all this Motu Patlu fighting game has a character like a snail, crab, tortoise, etc. Which will give a sense of enjoyment and fulfillment for the children who play this game? And also a lot of 1990-2000 born kids miss super Mario which they used to play long back because it doesn't have an android version. At those days super Mario can be played in video games .Recently it is launched for PC . This game serves as a good replacement for that game in android. This game has some additional features too . Like, autosave when a level is completed and auto start from the new level . This saves us the trouble because each and every time we don’t have to start from the beginning. How to download motu patlu fighting games? Once motu patlu fighting games download is complete click open to kick start the game. Then wait for some time till motu and patlu fighting games loads. Click on the play button to play motu patlu fighting games. And enjoy the game. Complete levels to fight the final boss on the 60th level. For motu patlu fighting games online access is not required so enjoy the game when and where you are. If you don’t have an android no worries. We can use blue stack app player to play motu patlu wwe fight games and all other such games play free online motu patlu fighting games in your PC by using blue stacks. For that, you need motu patlu fighting games apk. You can download apk from here. Download blue stack from this link. You can also download blue stack torrent from this link. Enjoy motu patlu fighting games!!! This game is a simple run from hurdles type game just like temple run. Here we can choose any player we want during the start. And in this game player keeps running on the conveyor belt and in the path electronic hurdles and coins will be there. The gameplay is simple the player has to collect the coins and escape from the hurdles by jumping up or lying down . Just swipe up to jump up and for down there is a control on the left bottom of the screen. This game has good graphics and this is kind of never ending game which means sometimes the hurdles repeating in a random manner.